Apple’s password manager for Macs, iPhones and iPads, iCloud Keychain is designed to keep passwords, credit card details, Wi-Fi logins and lots of other critical data safe while also making it much easier for you to create and recall complex passcodes. What does iCloud Keychain do? When you enter a new password in Safari, you’ve probably seen iCloud Keychain ask if you would like it to save it for use across all your devices. So long as you are running iOS 7.0.3 or later or OS X Mavericks 10.9 or later, iCloud Keychain will store the following items securely in iCloud. Once secured in iCloud Keychain, you will be able to access all these items securely from any Apple system logged into your Apple ID. Protect, access and deploy your LinkedIn, Twitter and other Internet account logins and passwords. How does iCloud Keychain work? iCloud Keychain must be enabled on each device. Devices that are not enabled for the service will not be able to access the information it holds, so you’ll need to enter your passwords and other details manually. How do I use iCloud Keychain in Safari? When registering for a new website or service you will be asked to enter your information in the site’s registration fields. iCloud will populate these fields with things such as your name and telephone number. You will also be asked to create a password by entering your new password in the password field and the password confirmation field. When you tap your cursor in the first of these fields you will see a small item appear, tap this to use an iCloud supplied password. In practice, if you use your own password or one supplied by iCloud, it should be stored for later use by your iCloud Keychain. How do I add credit card details to iCloud Keychain? On a Mac: Open Safari’s AutoFill item in Preferences. Look for the Credit Cards item and tap Edit. In the next screen, you will be able to add and delete new cards. Tap Done. On iOS: In Settings, open Safari>Autofill. Here you can choose to enable or disable Autofill of names and passwords, and as well as control what credit card information is held. Tap Saved Credit Cards, and you will be able to add or delete your stored credit card information. Tap Done. How do I use iCloud Keychain to find website passwords? On a Mac: Open Safari>Preferences and tap Passwords. You’ll be asked for a password. In the next page, you’ll be presented with a searchable list of your websites, user names and passwords. Copy and paste these using Control-Click. On iOS: Open up the Accounts & Passwords item in Settings, then tap the App & Website Passwords item. You’ll need to use TouchID, FaceID or a passcode and will then be able to access a searchable list of all the website passwords you use. You can also delete items from these collections. How do I enable/disable iCloud Keychain? On a Mac: Open System Preferences>iCloud>Check (or uncheck) Keychain. You’ll need to enter your Apple ID and follow a series of on-screen instructions. On iOS: In Settings, open Apple ID>iCloud>Keychain Toggle to on (or off). Once again, you’ll need to enter your Apple ID and follow a series of on-screen instructions. You must follow these steps for each device you want to enable for iCloud Keychain. What happens when I add a new device to iCloud Keychain? Something interesting happens when you do enable a new device — all your currently enabled devices will receive a notification requesting you approve the new device to join your chain. You must manually approve each addition from one of your existing collection of registered devices. That’s a good thing — it means you can usually expect a similar warning if someone tries to bring a device you do not own into your chain, and you can reject such a request. In some cases, you may not have access to any of your existing devices. In that case you will need to use your iCloud Security Code, or use something with the SMS phone number associated with your iClloud/Apple ID account. 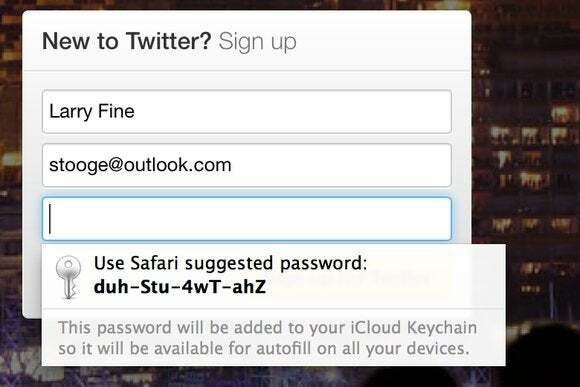 The iCloud Security Code is created when you first set up iCloud Keychain. If you no longer know that code, please follow these instructions. Most users can’t easily figure out if password management solutions from third-party vendors can be trusted. That’s not the case with iCloud Keychain, which is published by a developer with the resources to act quickly in the event a compromise is found. Security researchers occasionally identify potential flaws, which Apple customarily fixes fast. The best way to keep your iCloud Keychain safe is to keep your device software up to date. Keychain passwords and credit card numbers are encrypted with 256-bit AES (Advanced Encryption Standard). End to end encryption — your data is protected with a unique (device) key and your device passcode, which only you know. Two-factor authentication is also recommended. iCloud Keychain will also suggest and remember highly complex passcodes to you when they may be required, such as when registering for a new website service. That makes it much easier to follow good security practises, such as using a different passcode for every service. What else can iCloud Keychain do? On a Mac, you can also create and store secure notes in your iCloud Keychain. Such notes require their own password, as well as your account password, to access, making them highly secure spaces to store things such as software licenses. To create a secure note, open the Keychain application on your Mac, select ‘Secure Notes’ and click the Plus button. Write and name the note and tap Add. To access that note in the future you will need the password you set. Please drop me a line if you have any more questions (or answers) concerning iCloud Keychain.